L'Artisan La Chasse aux Papillons (note: this is a repeat of an earlier review): La Chasse aux Papillons was originally released by L’Artisan in 1999. It was created by nose Anne Flipo, and has notes of citrus, orange blossom, linden, tuberose, and jasmine. La Chasse is one of many fragrances that I dismissed on the first try, only to later become hopelessly smitten. It is the classic, ethereal spring-time white floral, very fresh and girly — a white floral even a white floral hater could love. It starts with light citrus notes and a lovely burst of linden. The orange blossom also adds a nice, dry zing, and helps to balance out the sweetness of the tuberose and jasmine. I wouldn’t exactly call it green, but there are grassy notes as well. It is not an overly complex perfume, but for what it is, it is perfect. Like most of the L’Artisan Eau de Toilettes, it is short lived; it lasts for about 3 to 4 hours on me. L'Artisan Tilleuls au Vent: The notes are linden and lemon tea. It is meant as the "sister" room fragrance to La Chasse, and as you might expect, it is even less complex. It is also more closely focussed on linden, and although there are hints of other floral notes, it has much less of a "white floral" feel than La Chasse. It starts rather sharp, but quickly calms to a bright, clear linden with green notes and a touch of honeyed sweetness. There is no soapiness at all. I think of D'Orsay Tilleul as a delicate fragrance, but when you smell them together, the D'Orsay version feels comparatively weighted down by the hay and beeswax. I still prefer the D'Orsay, but Tilleuls au Vent is a close second. The lasting power is surprisingly good for a room fragrance, but it still only lasts a couple hours on me. My reaction to La Chasse is identical to yours–at first, I dismissed it, but later I fell in love with it. I always think of it as a mist of linden and jasmine sambac, although on some days it is stronger on orange blossom and linden, with jasmine sambac hiding in the background. It is one of the fragrances that always elicits positive comments from strangers. Once, a cab driver refused to take money from me after he drove me to my destination, because he said that he enjoyed the smell of my fragrance very much and wanted to know what it is. Kind of an odd and funny incident. You should also try Demeter Linden, if you have not before. It is a pretty good rendition. Hi R! Adore La Chasse too especially layered with Chanel Gardenia parfum – an accidental discovery. 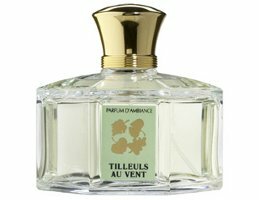 I did enjoy a small sample of Tilleuls au Vent but did not rush to purchase a bottle. Thanks for the reviews – wonderful as usual. Alas – I have tried La Chasse many times and it simply does not work for me. Perhaps on my skin the orange blossom is too pronounced? I have yet to figure it out since based on the notes this should be love. Oh well – I have many others to enjoy. I will seek out Tilleuls au Vent next time I am in NYC – I would like to try that version. Thank you for the reviews. Wonderfully informative, NST! Makes me really want to resniff samples, but I've probably thrown them away. I'm still SO enjoying my Extrait de Songe, though, FWIW–and the decants of Jasmin Vert and No. 3 you sent me! Hi V, Wow, I'll have to wear La Chasse next time I take a cab. That is quite a testimonial! N, will have to try layering them, that sounds lovely. I have no clue what linden smells like. How do you people know all these flowers? I feel like such a city hick. PBI: Kiev is awash with linden in bloom, as nearly all of Eastern European cities. You should also come to Philadelphia, which has many linden trees lining the streets. You are not a city hick! NYC just does not have that many fragrant trees. F, It is a sad life when you can't love orange blossom (HA HA HA). S, Exact same reaction I had, but it really grew on me eventually. The Extreme is quite different, and if you click on the link above or do a search you can see my review. L, Hope you saw that Extrait is almost certain to be pulled soon. Don't know if they will reissue it under a new name, but if you are at all attached to it you might want to get another bottle. Please don't hit my husband, LOL! Or my son for that matter…. LOL! I promise not to, however you know whom to ask if you change your mind. I can also just issue warnings in a stern Russian accented voice. That usually works for me. I only recently found out that La Chasse is a light chypre. Now it makes sense why it always reminded me of 4711, only more floral. It is an exquisite, artful little blend–flirtatious like butterflies. R, I read your review some days ago I was an avid reader of your reviews before I suscribed. Your blog is like a guide for me – sadly enough not everything is available in Germany & often the american/english perfumehouses refuse to ship samples to Germany Today I´ll try to test “Cèdre” from Serge Lutens, I hope, they do have it in stock! S, we all need to live in Paris. Here in the US we wait FOREVER for some of the European scents to arrive. The one linden perfume I want to try the most is still Pre de Provance's. I love their linden soap and lotion so much, but my stupid Wild Oats has yet to get the EDTs as part of their stock. They stocked Provence Sante's, which is pleasant, but nothing terribly lush or anything. I shall have to get going and try out that sample of La Chasse you sent! The discussion makes me wish I hadn't already spritzed with another scent this morning. I have never been able to find the Pre de Prevence (in person) either. Do try La Chasse! It is maybe another “pleasant” scent. I certainly didn't think much of it at first.